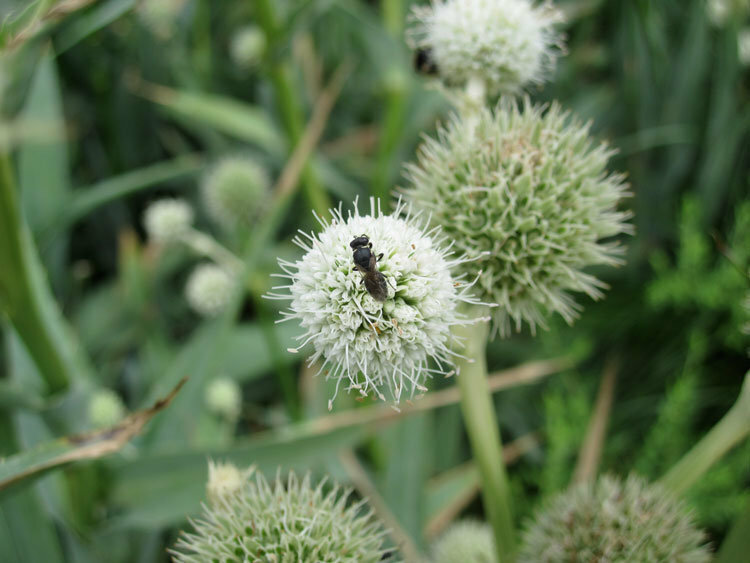 Wasp pollinating a rattlesnake master (Eryngium yuccifolium) bloom. Many wasps also parasitize garden pests. When insects appear on a favorite plant, one’s first inclination might be to grab the bottle of insecticidal soap. This isn’t always the wisest response, though. Each summer on the High Line we see aphids suddenly massed on the milkweeds (Asclepias spp. ), but if we wait a few days we usually find the population greatly reduced. Because aphids are the preferred food of many other insects, they can actually be good for the garden. Aphids support populations of beneficial insects that can keep other pest populations in check (and save our gardeners’ time and energy). In the gardens, we use integrated pest management (IPM) to determine when and how to control insect pests. The first part of this strategy involves reducing plant stress by choosing locations with appropriate light and moisture conditions for each plant species. A stressed plant not only has weakened chemical defenses, but can actually act as a beacon that attracts pests. Insects can pick up on chemical signals indicating a plant is in distress, much the same way wolves might target a weak member of a herd. The next step is to identify the insect and make sure it’s actually a pest and not a critter we want to have in our gardens. Keep in mind that larvae may look nothing like adults. Caterpillars are probably the most obvious example, but many other insects go through several life stages during which they might be unrecognizable. For instance, the shell-less larvae of the beloved ladybug look like scaly little alligators. Voracious hunters, these larvae are as welcome in the garden as their adult counterparts. Chinese mantis (Tenodera sinensis) on Hyssop-leaf thoroughwort (Eupatorium hyssopifolium). The adult is easily recognizable, but the mantis egg case, which looks sort of like a dirty marshmallow, could be mistaken for a gall or a fungus..
One of the most variable and complex aspects of IPM is determining thresholds for both aesthetics and plant health. We assess damage on a case-by-case basis. As a naturalistic garden, we have a higher tolerance for aesthetic damage than a more formal garden might, but there’s still a point when we need to intervene to keep the gardens looking beautiful. Intervention may take several forms, including biological controls and hand removal of pests and infested plant material. Some pests pose a grave threat to plant health, even before the damage becomes visible. The bronze birch borer (Agrilus anxius), for example, requires immediate action. Other insects like the large milkweed beetle (Oncopeltus fasciatus) may be quite abundant without doing any serious damage. 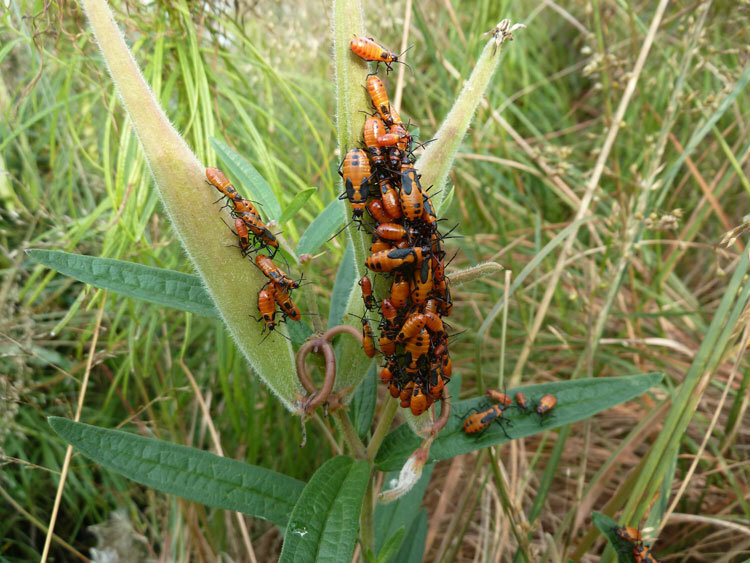 Large milkweed beetles (Oncopeltus fasciatus) feeding on butterfly weed (Asclepias tuberosa) seeds. 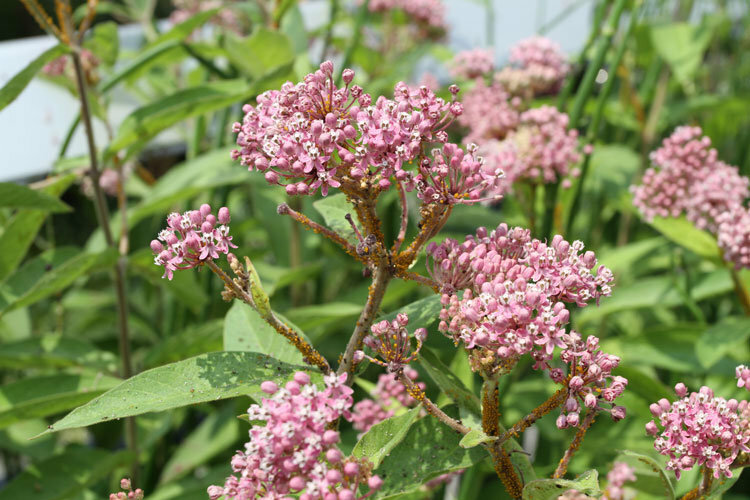 Though abundant, these native insects don’t do any real damage in our gardens. The root-feeding larvae of the Asiatic garden beetle require continuous management efforts. We apply nematodes – round worms that occupy different niches in the soil food web – as a biological control. The nematode species we use (Heterorhabditis bacteriophora) are parasitoid, meaning that they kill their hosts. The young nematodes hatch inside and feed upon the grubs before moving into the soil. 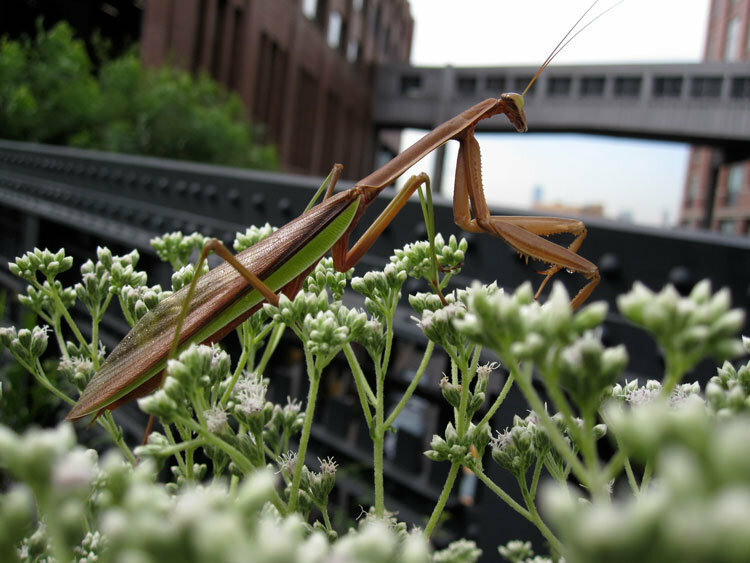 A number of factors, including habitat fragmentation, upset the natural balance between pests and predators in the urban garden. As a rule, predators need a larger range than their prey. Because our gardens are surrounded primarily by concrete, there is limited habitat to support some of the predators that would keep pest populations in check. Without predation, even critters we want to have in the garden can get out of hand. For instance, this summer caterpillars of the painted lady butterfly (Vanessa cardui) began to decimate a newly planted group of pearly everlasting plants (Anaphalis margaritacea). Fortunately, painted lady populations are stable, so we could pick off about a third of the caterpillars without worrying about contributing to a larger-scale population decline. If monarch caterpillars (Danaus plexippus), whose populations have declined precipitously in recent years, were causing damage in the garden, we would not be likely to interfere. Maintaining a balance is at the heart of IPM. In order to attract beneficial insects and other animals, we need to allow pests to play a part in our gardens. On the High Line, we continually evaluate and adjust our management strategies to best benefit the gardens and the animals that rely on them. Given the numerous challenges posed by habitat fragmentation, invasive species and microclimates, IPM in our urban context demands both curiosity and agility.